A frog is any member of a diverse and largely carnivorous group of short-bodied, tailless amphibians composing the order Anura (Ancient Greek an-, without + oura, tail). The oldest fossil “proto-frog” appeared in the early Triassic of Madagascar, but molecular clock dating suggests their origins may extend further back to the Permian, 265 million years ago. Frogs are widely distributed, ranging from the tropics to subarctic regions, but the greatest concentration of species diversity is in tropical rainforests. There are approximately 4,800 recorded species, accounting for over 85% of extant amphibian species. They are also one of the five most diverse vertebrate orders. The body plan of an adult frog is generally characterized by a stout body, protruding eyes, cleft tongue, limbs folded underneath, and the absence of a tail in adults. Besides living in fresh water and on dry land, the adults of some species are adapted for living underground or in trees. The skin of the frog is glandular, with secretions ranging from distasteful to toxic. Warty species of frog tend to be called toads but the distinction between frogs and toads is based on informal naming conventions concentrating on the warts rather than taxonomy or evolutionary history; some toads are more closely related to frogs than to other toads. Frogs’ skins vary in colour from well-camouflaged dappled brown, grey and green to vivid patterns of bright red or yellow and black to advertise toxicity and warn off predators. 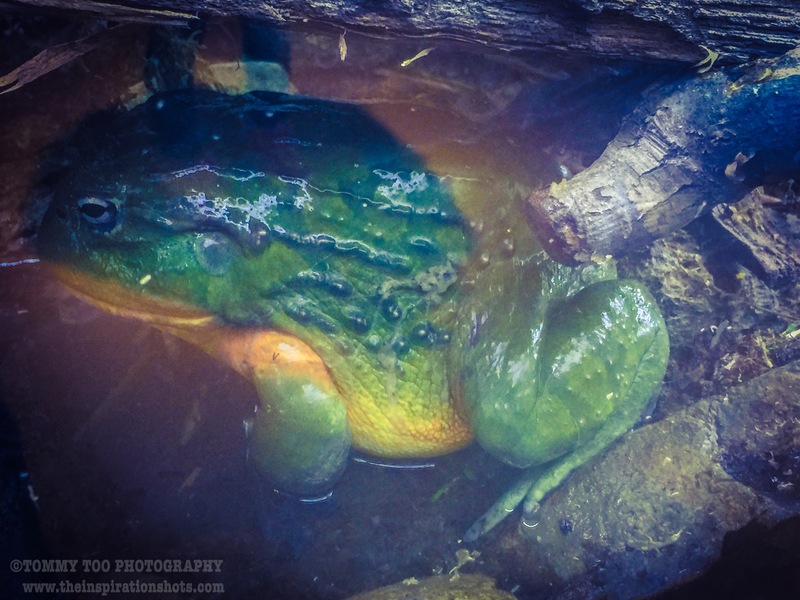 Frogs typically lay their eggs in water. The eggs hatch into aquatic larvae called tadpoles that have tails and internal gills. They have highly specialized rasping mouth parts suitable for herbivorous, omnivorous or planktivorous diets. The life cycle is completed when they metamorphose into adults. A few species deposit eggs on land or bypass the tadpole stage. Adult frogs generally have a carnivorous diet consisting of small invertebrates, but omnivorous species exist and a few feed on fruit. Frogs are extremely efficient at converting what they eat into body mass. They are an important food source for predators and part of the food web dynamics of many of the world’s ecosystems. The skin is semi-permeable, making them susceptible to dehydration, so they either live in moist places or have special adaptations to deal with dry habitats. Frogs produce a wide range of vocalizations, particularly in their breeding season, and exhibit many different kinds of complex behaviors to attract mates, to fend off predators and to generally survive. The name frog derives from Old English frogga, abbreviated to frox, forsc, and frosc, probably deriving from Proto-Indo-European preu = “to jump”. About 88% of amphibian species are classified in the order Anura. These include around 4,810 species in 33 families, of which the Leptodactylidae (1,100 spp. ), Hylidae (800 spp.) and Ranidae (750 spp.) are the richest in species. The use of the common names “frog” and “toad” has no taxonomic justification. From a classification perspective, all members of the order Anura are frogs, but only members of the family Bufonidae are considered “true toads”. The use of the term “frog” in common names usually refers to species that are aquatic or semi-aquatic and have smooth, moist skins; the term “toad” generally refers to species that are terrestrial with dry, warty skins. There are numerous exceptions to this rule. The European fire-bellied toad (Bombina bombina) has a slightly warty skin and prefers a watery habitat whereas the Panamanian golden frog (Atelopus zeteki) is in the toad family Bufonidae and has a smooth skin. The Anura include all modern frogs and any fossil species that fit within the anuran definition. The characteristics of anuran adults include: 9 or fewer presacral vertebrae, the presence of a urostyle formed of fused vertebrae, no tail, a long and forward-sloping ilium, shorter fore limbs than hind limbs, radius and ulna fused, tibia and fibula fused, elongated ankle bones, absence of a prefrontal bone, presence of a hyoid plate, a lower jaw teeth (with the exception of Gastrotheca guentheri) consisting of three pairs of bones (angulosplenial, dentary, and mentomeckelian, with the last pair being absent in Pipoidea), an unsupported tongue, lymph spaces underneath the skin, and a muscle, the protractor lentis, attached to the lens of the eye. The anuran larva or tadpole has a single central respiratory spiracle and mouthparts consisting of keratinous beaks and denticles. Frogs and toads are broadly classified into three suborders: Archaeobatrachia, which includes four families of primitive frogs; Mesobatrachia, which includes five families of more evolutionary intermediate frogs; and Neobatrachia, by far the largest group, which contains the remaining 24 families of modern frogs, including most common species throughout the world. The Neobatrachia suborder is further divided into the two superfamilies Hyloidea and Ranoidea. This classification is based on such morphological features as the number of vertebrae, the structure of the pectoral girdle, and the morphology of tadpoles. While this classification is largely accepted, relationships among families of frogs are still debated.